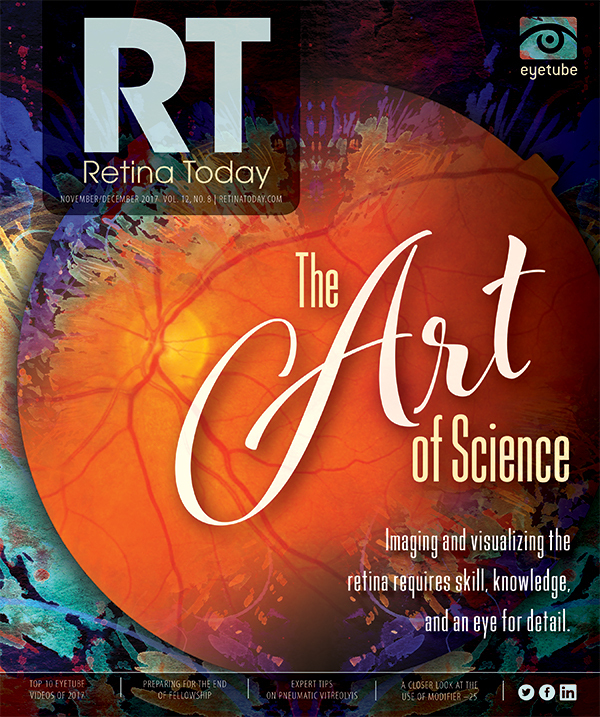 A do-it-yourself ethos—and a lack of commercial availability—drove this ophthalmologist to design his own system. It was a September morning in 2012 at Ankara University in Turkey. 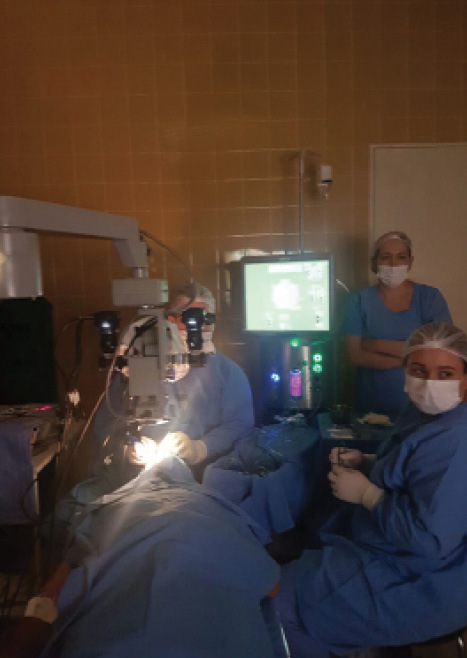 Three posterior vitrectomy surgeries were to be transmitted in a live surgery session to an auditorium. The surgeons executing these procedures were Stanley Chang, MD, of Columbia University in New York; Carl Claes, MD, of St. Augustinus Hospital in Antwerp, Belgium; and Athanasios Nikolakopoulos, PhD, of the Papanikolaou Hospital in Thessaloniki, Greece. As you can imagine, with this faculty there was much to observe and learn during this excellent surgical demonstration. • With the help of an engineer, the author designed his own 3-D heads-up surgical viewing system. • The system has been used successfully for anterior and posterior segment surgeries. • The system has allowed a reduction in illumination that in turn reduces the risk of retinal phototoxicity. In 2012, video cameras with high-quality images were extremely expensive, if available at all. A 4K 3-D television alone could cost more than US $10,000, and few people had any idea how to produce 3-D video images. At the time, I was still a surgical retina fellow in South America. Although I had an outstanding professor, access to good equipment, and the opportunity to perform a large number of cases per week, this is a region where technological novelties always arrive late and cost three or four times what they cost in more developed countries. Even so, during my fellowship program I kept researching and studying all the content I could find related to surgical video cameras for eye surgery and systems and equipment that could help me create my own 3-D recording system. I believed that 3-D video would be the standard medium for presentations at professional meetings in the future, helping to enrich discussion and education, and I wanted to be prepared to present my work. I had no interest in heads-up surgery until 2014, when I attended an instructional course at the Euretina congress in London. At that course, I had the opportunity to meet Florian Baltã, MD, of Bucharest, Romania, renowned for performing the first live transmission 3-D surgical video, and to see again Christopher D. Riemann, MD, of the Cincinnati Eye Institute in Ohio, who published articles about the use of this kind of technology as early as 2010. These two gentlemen, together with Dr. Nikolakopoulos, shared knowledge that allowed me to go further in my own research regarding 3-D surgical video recording. They also got me thinking about adding heads-up capability into my viewing system, enabling the system to be used in surgery in real time. I knew I would need an engineer to help develop this technology. We spend 6 years in medical school and another 6 between residency and fellowship, and after a dozen years we are extremely well-educated technicians. We memorize thousands of pages of dense content and learn how to use it. But there is almost no thinking outside of the medical box. 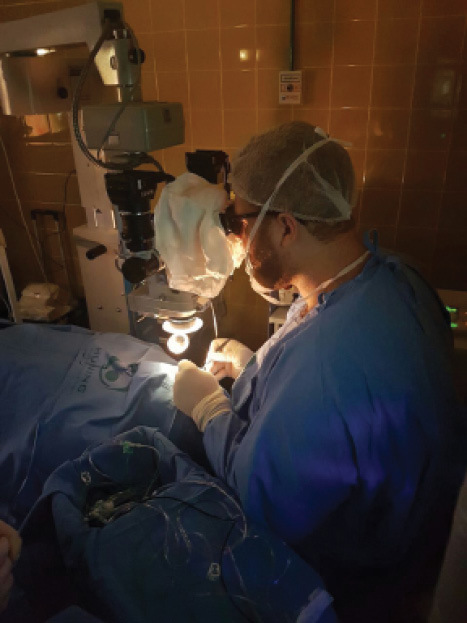 Gustavo Hüning, MD, MBA, DiSSO, and Lair Hüning, MD, MSc, MBA, perform combined cataract and retina surgery using their own 3-D viewing system. I had no training in audiovisual sciences. It was clear that, despite all my research, I needed specialized help. After searching for more than a year, including getting in touch with European optical engineers, I found a computer sciences engineer to work with. His company specialized in designing and installing audiovisual systems for nightclubs. This might seem crazy, but he was the only person I could find who knew what I needed and understood how to improve what I had so far done by myself. Many articles have been published in the past 2 years about heads-up surgery, but it is important to note some technical specifications for those who are interested in designing their own systems. The TV monitor should be 3-D capable with 4K ultrahigh-definition (UHD) resolution (3840 x 2160 pixels). But the cameras I recommend are full high-definition (HD) resolution (1920 x 1080 pixels). Why use cameras with less resolution than the monitor? Picture the light sensor as a plate: If we put more pixels on the plate in the same area, they will each have to be a smaller size. If they are smaller, they cannot absorb as much light as the bigger pixel on a full HD sensor can. We still need the 4K UHD screen, however, because to achieve the 3-D view we need two cameras (which mimic our stereoscopic eyes), and their image resolution will be summed on the screen by passing through a 3-D processor. The processor synchronizes and fuses the two views and then sends the final image to the 3-D screen. Described in this way, the process may sound easy. But the truth is that we face a number of challenges: aligning the microscope and all its components, finding the proper focus for each camera, positioning the images on the screen from the two cameras, determining the delays in each part of the system and trying to reduce them. This is just the beginning of the challenges we faced when trying to make the 3-D system work. After you have conquered them, however, the result is worth every second you have spent in effort and researching. Figure 1. The author performing retina surgery with the 3-D system he helped create. We performed our first pars plana vitrectomy (PPV) with 3-D heads-up display in December 2016 (Figure 1). Ever since, as we have operated and tested the system, we have discovered new details that could be improved to refine every aspect. Would it not have been easier to buy a ready-made commercial system? One problem was that, a year ago, there was no 3-D heads-up surgery system available in Brazil. In addition, the knowledge we had accumulated and the work we had done allowed us to be on the vanguard of heads-up 3-D viewing systems for ophthalmology in our country. As of October 2017, our system had been used for PPV in 103 cases, ranging from proliferative diabetic retinopathy with vitreoretinal proliferation to macular peeling (Video). It has also been used in 40 phacoemulsification cataract surgeries. Considering that the normal reaction time of a human being is approximately 300 ms, and that our system projects surgical images with a 114 ms delay, the system entails a 38% delay in human reaction time. This is acceptable in PPV surgery but considerable in phacoemulsification. It is important to note that recording surgeries became more expensive because the 3-D files contain more information and therefore need more storage space than 2-D files. On the plus side, cameras can capture more light than our eyes and project bright images onto our monitors. That is why, with an OPMI MD microscope (Carl Zeiss Meditec) allied to a BIOM ready biomicroscope (Oculus), I went from using a level of 90% on the xenon light of the Stellaris PC (Bausch + Lomb) to using 20%. This reduction greatly lessens the chances of retinal phototoxicity. We also no longer need laser filters, and we have better imaging and control during photocoagulation. Figure 2. A 3-D viewing system allows the surgical staff to view exactly what the surgeon sees. The whole OR team has the same view I have (Figure 2), making surgeries faster as the nurses can predict my needs, and giving me the chance to train young surgeons at the same time. Macular peeling has become a more delightful experience when done on a 60-inch screen; we can now see details we could not see before. Ergonomics is one of the biggest benefits of this technology. Just imagine our backs and necks being straight during the whole day, so different from when we depended exclusively on the oculars of the microscope. Even so, in our system we were able to leave the oculars available to the surgeon, in case he or she might feel safer or more comfortable using them during any step of a procedure. On the downside, future microscopes will have to change their construction design because the metal rod that holds the optical structure is positioned directly in front of us, between our eyes and the monitor, obligating us to turn our necks to the left or right at least 20°, making the position uncomfortable for our cervical spine during long surgical sessions. Perhaps an L-shaped rod would solve this issue in the future. Here I must acknowledge three other surgeons who have helped me with this research into 3-D heads-up surgery. These are my two brothers—one a fellow and the other a third-year resident—and my father, an experienced cataract surgeon. All three have used the system, and they all adapted to it quickly. They report that they like the color contrast adaptability (we can use TV filters) and the depth sensation. 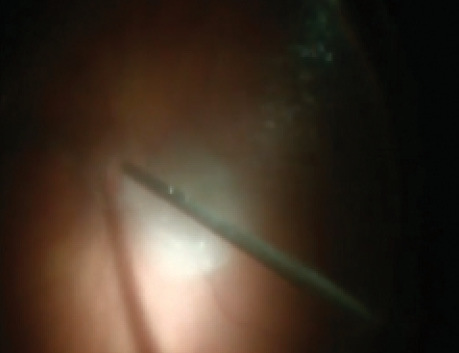 They also considered the capsulorrhexis step in cataract surgery to be easier to perform with this system than with a conventional microscope because of the image size. Considering the whole journey and what we have learned so far, we are looking forward to a near future when we all will have 8K televisions and augmented reality added to our 3-D heads-up surgery systems. Until then, I hope we will be able to keep pace with all these novelties in our corner of the planet, offering state-of-the-art, cutting-edge eye care with more precise surgery and better results for our patients.